This CellML model has been built from a mathematical model of placental oxygen transfer by Ester Hill, Gondon Power and Lawrence Longo (1972). This file is known to run in openCOR. The parameters in Table 1 of the paper has been changed to make them consistent with human placenta. During pregnancy, the placenta acts as the fetal lungs since the gas exchange between mother and fetus takes place at the placental capillaries. An efficient feto-maternal gas exchange is essential for fetal well-being and growth. This gas exchange mainly occurs via diffusion and is controlled by multiple factors such as maternal and fetal blood volume, blood flow rate, partial pressure of oxygen, hemoglobin concentration and oxygen diffusivity. Using these parameters,the model predicts the maternal and fetal oxygen partial pressure/content at the end of capillary transit time. A schematic diagram of feto-maternal gas exchange at placental capillary: deoxygenated blood carried by the fetal artery enters into the capillary where the diffusion of maternal oxygen occurs. Due to the oxygen gain, the fetal blood becomes well oxygenated after the exchange and travels towards the fetus via the fetal vein. The top graph shows the changes in partial pressure of oxygen in maternal and fetal blood during the capillary transit time. 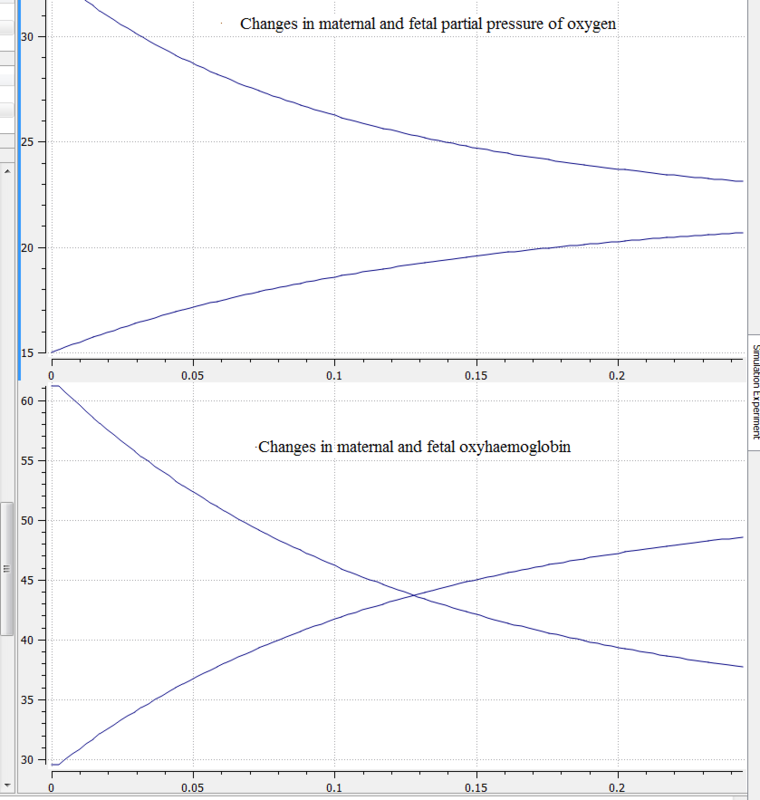 The bottom graph shows the changes in maternal and fetal oxyhaemoglobin during the capillary transit time. Ester Hill, G.P., Lawrence Longo, A mathematical model of placental O2 transfer with consideration of hemoglobin reaction rates. American Journal of Physiology (1972). 222(3): p. 721- 728. Derived from workspace Hill, 1972 - a model of feto-maternal oxygen exchange at changeset 2cf04f333fad.